Here's a Memorial Day Weekend quiz. Who can be the first to identify this luscious-colored moth? It is often found in grasslands, and can be tucked under a bunch of grass, not flying, just ambling through the blades of grass. Good luck! I'd love to have a sweater with this pattern and the fuzzy collar. Congrats to Kathe for the ID, and it's not the first one either. Great name for this lovely creature. The most beautiful patterns and color combinations appear in nature; fiber artists often translate natural designs into quilts, knits and woven items. Wild Gulch offers much inspiration to fiber artists and others. 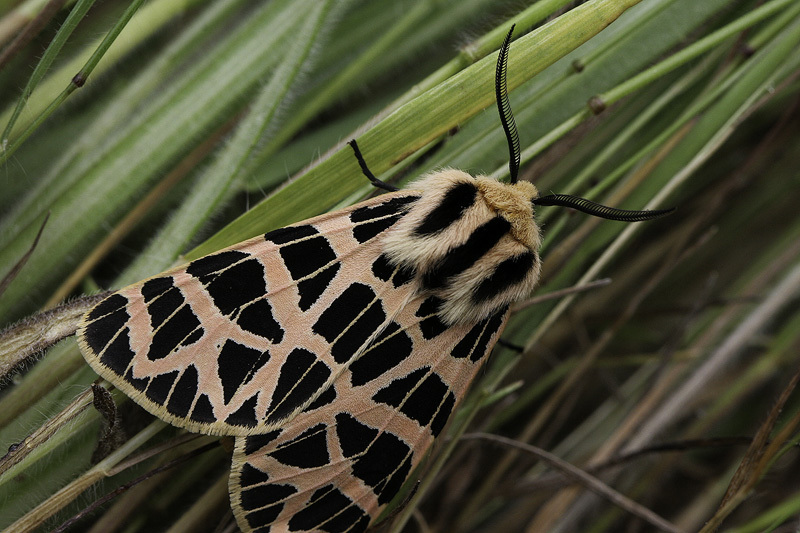 Is tis really an Ornate Tiger Moth?